1. NZDCAD: buy : 1/11/2012 Two of my rules where met and the trend is strong, made use of a h4 setup to get entry into this trade currently negative 40 pips but all the rules are now in play giving another signal so I will sit tight. 2. EURAUD: buy 1/11/2012 All three my rules were in place, closed the trade today with a 150 pip profit. What a stunning trade! 4. 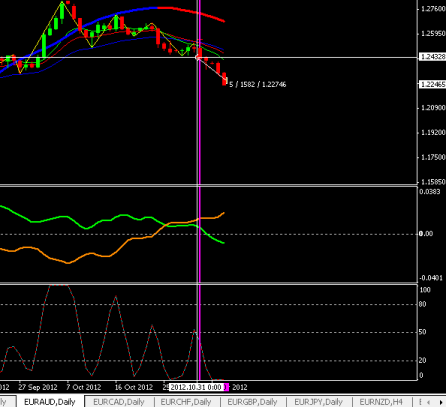 AUDCHF: buy: 6/11/2012 Two of my rules were met, just the oscillator that is overbought. Due to the strength of the trend and the match of the currencies I decided to take a trade on a one hour chart. So anything can happen, will watch this one closely.